Warwickshire has eight Branch Associations, each with a programme of activities throughout the year. Honey bees are only active during the spring and summer, so the summer programme focuses on the apiary and the practical aspects of managing honey bees through the season. During the winter months each branch arranges a programme of talks and demonstrations. If you are thinking of keeping bees, it is a good idea to come to branch meetings and find out more about the hobby and experience handling bees before you finally decide that beekeeping is for you. Most branches also run short introductory courses, which are invaluable for the beginner and cover the history of beekeeping, the lifecycle of the honeybee, general husbandry, equipment required and pests/diseases and their treatment. With a bit of knowledge to your elbow, when you take your first look at a hive, you see more than just a lot of buzzing insects. In spring and early summer bees can be seen working the flowers from early morning until late, even in the rain. Bees visit flowers to gather nectar, which they turn into honey, and pollen, which provides them with protein. Unless there is an apiary nearby, the bees in the garden are most likely varieties of Bumble Bees, or Bombus. There are many varieties of Bombus of different sizes, although generally they are recognisable by their distinctive colouring and loud buzzing. Most are larger than the European honey bee, Apis mellifera. There are other significant differences. The honeybee has much less hair and is altogether a much slimmer insect. Just compare the pictures. 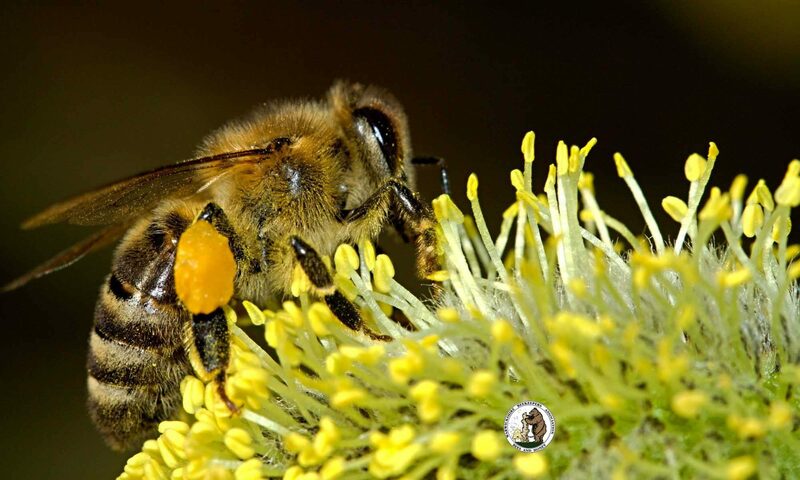 Because the honeybee is smaller and has a shorter proboscis (tongue), she cannot get nectar from the wide range of flowers frequented by the bumblebee. Honey bees are therefore more selective in their method of foraging. Bumble bees work alone whereas honey bees work together, sharing and communicating information about the best source of food. Honey bees are generally described as “social” insects because they work together for the good of the colony with a distinct division of labour. Honey bees take food back to the nest and give it to house bees (bees who work in the hive) who process and store it for future use. Using their stored food resources, honey bees can survive the winter months whereas the bumble bee nest dies out in late summer and only newly mated queens survive the winter by hibernating. Bumble bees will gather nectar and pollen at lower temperatures than honey bees and thus will be seen working earlier and later in the day than honey bees. We can think of the honey bee system of communication as a form of language. Food sharing is a way of communicating. Honey bees also communicate by “dancing”, that is they can describe spatial patterns in relation to the sun which indicate to other bees the distance and direction of a worthwhile food source. Bumble bees forage from flower to flower, from dawn to dusk, looking for what they can find. There are also types of solitary bees, such as masonry bees, which are usually smaller than honey bees and, as the name suggests, work alone. Many solitary bees may colonise a particular area and thus appear to be part of a colony, but they will all be working alone. If you would like to learn more about Honey Bees, or how to start beekeeping contact the secretary of the branch nearest you. Find details in their branch page or on their websites. Use the Branch menu to find your nearest.